My typist, a girl in her early twenties, always looks fresh and pleasant. If asked if she used any ‘make-up’ I’d have answered ‘Not in your life!’. Maybe she uses a little cream at nights and dabs a bit of powder on her nose but she’s a natural type brought up as one of a big family and she knows men hate paint and powder. On asking her what she did use it came as a bit of a surprise to find that as part of her daily routine she used powder, lipstick, rouge, foundation cream, cleansing cream, witch hazel, hand cream, mascara, nail polish, polish remover, cuticle oil, shampoo, and body talc. Though she didn’t mention them I take it that she also uses soap, bath salts, toothpaste, some form of hair oil and probably a few other items. She told me too that she had powder puffs, tissues, emery boards, a nail file, an eyebrow plucker and nail scissors. On visiting a barber’s shop and watching a dozen men being attended to I noted that besides shaving soap or cream, toothpaste, soap and brilliantine men liked face spray after being shaved, an application of alum or spirit to heal any scratch of the barber’s razor and took a powdering as a matter of course. Most men wanted a little oil on their hair. The barbers appeared anxious to persuade their customers that a little dandruff preparation, a hair restorer or some brilliantine was really necessary to take with them. Cosmetics have become as much a part of civilized life as clothes. Even women convicts are nowadays allowed to use a little ‘make-up’ and reports show that this privilege has resulted in a great improvement in morale with consequent better behaviour and more discipline. We know that cosmetics have been used for thousands of years. The very word alcohol comes from the black antimony powder used by Eastern women in darkening their eyelashes and eyebrows. Probably most prehistoric chemistry was devoted to the search for beauty preparations and spirit, playing a big part, became confused with eyelash darkener. With the general use, cosmetic fortunes have been made, are being made and will be made in business. Unfortunately, the immense profits have brought plenty of unscrupulous people into the advertising, manufacturing and selling branches of the cosmetic industry. We know or should know that nowadays scents are made from coaltar derivatives more than from flowers. Hairdye is not only from henna or sage but is from many synthetic substances. Face powder can be manufactured from zinc oxide as well as from rice, chalk, orris root or talcum. In hair oils and brilliantine lard, glycerine, beeswax, coconut, castor and olive oils as well as from petroleum jelly and paraffin whilst quite a lot of spirit is also used as is quinine. Lipstick maybe mostly lard or other heavy fat coloured and perfumed. Investigations made under the United States Pure Food and Drug Act show that despite the provisions of the Act there is still quite a lot of harmful substances being used in cheap preparations. Salts of bismuth, of copper and of silver and even really poisonous spirits of lead are continually being found. All of which proves the necessity of only using the products of world known firms who could never dare the risk of being brought before the Courts for use of harmful or noxious ingredients. It is surprising how little use is made of the many cheap, easily got or made up materials always next to us. Oatmeal, buttermilk, fresh milk, eggs, Epsom Salts, bicarbonate of soda, lemons, Fullers Earth, glycerine, talcum powder, salicylic acid, lanoline and eau-de-cologne to mention a few. Lemons can and should play one of the most important parts of the toilet table and bathroom. There is no other dandruff remover as effective, it can be used in place of bath salts or in combination with them. Epsom Salts as bath salts and lemon juice is unequalled in cleaning the nails and preparing them for polish and cuticle treatment. Whatever preparation helps to improve the appearance of man or woman can be classified as cosmetic – that which aids to adorn. So oatmeal mixed into a paste with a little olive oil and a few drops of lemon juice makes a face and neck cleanser and food which is unbeatable. 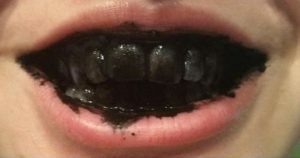 Who has ever tried powdered charcoal as a mouthwash and most wonderful teeth cleaner? Still, it requires a strong mind to use it as one’s first impression is that the inside of the mouth and the tongue have been blackened permanently. Salt and Bicarbonate of soda, however, combine to form a very effective tooth powder and gargle. Cosmetics, what they are! To what extent are they used? How do they influence the average person’s monthly budget? How many are employed in the industry? These and a host of other questions and ideas are suggested by the word. A fascinating world of flower gardens, of laboratories, of factories, is conjured up. How many know that thousands of acres are planted to a species of geranium from which an oil is expressed to form the base of exquisite, very highly priced Parisian scents. How much lipstick will come from whale fat or groundnuts? How many superlatives or poetry has been and will be conjured from the minds of advertisement writers? It is a fascinating subject well worth studying and knowing about.